When investing in stocks, understanding the volatility of their returns can be an important ingredient to help investors maintain a disciplined approach. People invest their capital hoping to earn a rate of return above that of just holding cash, and there is ample evidence that capital markets have rewarded disciplined investors. For example, Exhibit 1 illustrates what investing $1 in 1926 into various asset classes would have translated to through the end of 2016. Nevertheless, returns can be negative for days, months, and even years. After such episodes, investors are frequently exposed to stories exclaiming what may cause the next financial crisis. A simple way to see if stock market volatility and returns are related is to look at average returns across different market environments. In Exhibit 2, we take monthly returns for the US equity market (represented by the Fama/French US Total Market Index) and break them up based on the previous month’s standard deviation (computed using daily stock market returns). 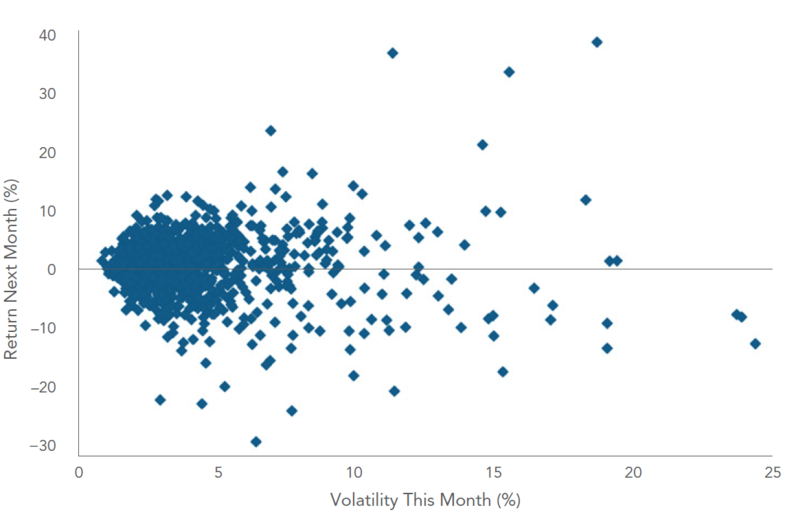 Average returns in months when the previous month had higher volatility (75th percentile or above) were slightly higher than when the previous month had lower volatility (25th percentile or below). This conforms with the intuition presented by Fama. But, because stock returns have been noisy, these differences in average returns have not been reliably different from zero. In other words, at a glance there does not seem to be an economically meaningful difference in average equity returns based on the volatility of the prior month. Exhibit 2 demonstrates that average stock market returns appear similar across various levels of market volatility. Is the equity premium (the return over US Treasury bills, or “T-bills”) also similar across different levels of volatility? Exhibit 3 shows the average monthly returns for the US equity market and T-bills from January 1927 through April 2016. The full sample is further broken out into average returns for months following a “high volatility” month (75th percentile or above) and the remaining months. 1. Eugene Fama and Kenneth French, “Q&A: Timing Volatility,” Fama/French Forum, December 19, 2008, www.dimensional.com/famafrench/questions-answers/qa-timing-volatility.aspx.